Fallsview wedding reception at the Sheraton on the Falls. 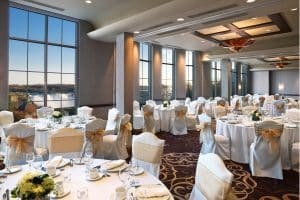 If you’re planning on tying the knot in the near future and looking for the perfect venue to host the wedding of your dreams, look no further than the Sheraton on the Falls hotel in Niagara Falls, Ontario. Situated directly across the street from the beautiful Niagara Falls, the Sheraton on the Falls offers an incredible location, world-class amenities, spectacular venues, and so much more that will make your wedding day truly romantic and unforgettable. The Sheraton on the Falls is a wonderful wedding destination that can host both intimate gatherings and grand affairs with a variety of venue choices including an outdoor rooftop gazebo, Fallsview studio, and grand ballroom. The outdoor gazebo is a breathtaking venue that overlooks the thundering Niagara Falls and can host a gathering of up to 30 people, while the Fallsview Studio is a spectacular room that can host up to 130 people and features direct views of the waterfalls. And for larger receptions, the Sheraton’s Great Room is an amazing space that can accommodate up to 1200 people, and be split up into sections that host up to 400 people each. Along with unique and beautiful venues, the Sheraton on the Falls offers a variety of delicious catering selections and specialized menus that can be tailored to suit your culinary needs. The hotel’s talented food and beverage team will help make your catering planning both effortless and easy, meaning you can savour your wedding’s exquisite cuisine without having to worry about a thing. And after the wedding is over, the Sheraton on the Falls offers remarkable Fallsview suites in which the newlywed couple can relax and unwind. And the hotel’s Christienne Fallsview Spa is a wonderful retreat that offers a wide range of romantic and rejuvenating couples spa services to be experienced while directly overlooking Niagara Falls. Niagara Falls has everything you need to make your wedding day unforgettable and the team at the Sheraton on the Falls hotel will make the wedding of your dreams come to life, helping you to start off your married life in truly spectacular fashion.